Chelsea made light of striker Diego Costa's absence to extend their lead at the top of the Premier League to seven points on Saturday with a 3-0 win at champions Leicester City. After a Harry Kane-inspired Tottenham Hotspur and a ruthless Arsenal side kept up the pressure at the top with 4-0 victories, Chelsea found an unlikely hero in wing back Marcos Alonso, who scored their first two goals at the King Power Stadium. All the pre-match ballyhoo had been about Costa, the league's leading marksman, having been dropped from Antonio Conte's squad amid reports of a fall-out over his fitness. Before the game, though, Chelsea released quotes from Conte on their official Twitter site saying that Costa had not trained since Tuesday because of "a pain in his back". "We played without Diego against Bournemouth and we have had time to prepare for this. We've prepared very well," Conte said. That preparation was shown swiftly as Spaniard Alonso struck early in both halves and Pedro completed a rout of the feeble champions as Chelsea moved to 52 points, seven clear of Spurs. Liverpool, on 44 with third-placed Arsenal, could regain second spot and cut the gap at the top back to five points if they win at Manchester United, who are fifth, on Sunday. 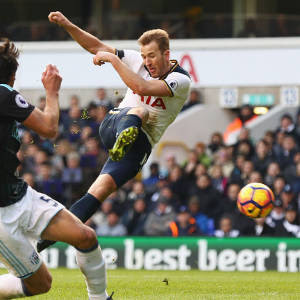 Tottenham striker Kane had a special day with a brilliant hat-trick in the 4-0 demolition of West Bromwich Albion that saw Mauricio Pochettino's ever-improving contenders move into second with a seventh straight win in all competitions. It was Kane's first match since he became a father last Sunday. "It's amazing. The week has been a whirlwind having a little daughter - to finish it off like this is the best way possible," he said, after taking his season's tally to 13 league goals. Arsenal went up to third on goal difference after Olivier Giroud struck his fifth goal in as many games to set them on the way to a 4-0 trouncing of Swansea City, who are now bottom. Between Giroud's opener and Alexis Sanchez's 73rd minute effort, Paul Clement, in his first league game in charge of the Swans, also had to watch miserably as Jack Cork and Kyle Naughton deflected Alex Iwobi shots past their own keeper. Hull City recovered to beat Bournemouth 3-1 with a double from Abel Hernandez giving new manager Marco Silva the ideal league debut as they leapt from last place above Swansea and Sunderland, who were beaten 3-1 at home by Stoke City. Peter Crouch scored his 99th league goal for the Potters - a header, naturally - while Marko Arnautovic netted twice, but the goal of the day came from West Ham's Andy Carroll who struck an astonishing mid-air volley in a 3-0 win over Crystal Palace. "It's been a while in the making. I've been trying for a couple of years. It's got to be the best goal I've scored," the striker, who has suffered from a string of injuries, said. "It was an incredible thing for him to bring me back with the circus that goes on around me," said Barton, paying tribute to Burnley boss Sean Dyche, who signed the midfielder after his stormy spell with Scottish club Rangers. At the club he took from the old fourth division into the top flight, the chant of "One Graham Taylor" rang around the ground, fans in the stand named after him held up cards that spelt out "Love G.T" and others were reduced to tears. However, after a long round of applause for their old manager, the Hornets could not deliver the result the supporters craved as they missed chances and were held to a 0-0 draw.